Whenever a run on HQ or R&D ends, place 1 power counter on The Turning Wheel if you stole no agendas during the run. 2 hosted power counters: For the remainder of this run, access 1 additional card from HQ or R&D. Does The Turning Wheel allow the Runner to increase their accesses for both R&D and HQ or only one at a time? Each time the Runner uses The Turning Wheel's ability, they must declare the server from which they wish to access additional cards. After using The Turning Wheel, when does the Runner access an additional card? Each time the Runner accesses cards from HQ or R&D for the remainder of the run. 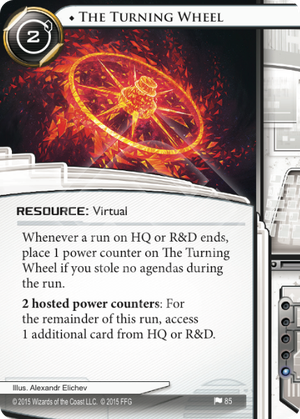 After using The Turning Wheel, can the Runner choose to access a card from R&D when they access a card from HQ and vice versa? No. The Turning Wheel’s extra accesses are from whichever server the Runner accesses. Can the Runner wait to see the first card they will access from R&D before deciding to use The Turning Wheel to access another card? No. The Turning Wheel’s ability is activated during paid ability windows and thus cannot be used once accessing has begun. The Runner activates The Turning Wheel’s ability during an on-access encounter with Archangel. If they continues to access more cards during the run, the get an additional access from The Turning Wheel? No. The number of cards the Runner accesses during a run on HQ or R&D is determined at the beginning of the access step; it cannot be increased after that point. Bounce off R&D or HQ for credits, power counters, and card reveals. When you see something you want with Reflection, go get it from HQ by spending a bunch of power counters. One other thing: a scored Nisei MK II makes this card very sad. Watch out for that. Sure, if you compare this indian roulette to any other multi-access on R&D or HQ, one may argue that it's better to hit one of these server hard and tough than browsing from one to the other for accessing 1 more card every other run. The Turning Wheel is certainly not very good on its own, but it strongly supports any kind of R&D or HQ pressure. The obvious use is for Criminals and Shapers, who are overspecialized in HQ and R&D hitting respectively, and struggle to put some pressure on the other. The usual way to do is to import R&D Interface in criminal decks and Legwork in shaper decks. Now, they can either put 2 Turning Wheels for the same influence and find it earlier, or just one and free 1 influence point. Of course, you've got to keep your other in-faction pressure and multi-access. But now you can hit the other server more steadily than with your imported The Maker's Eye or Legwork, and for cheaper than with R&D Interface and HQ Interface. Now, the question is if it is worthy in Anarch deck. Not that this matters in the current meta, but hey, the wheel is turning! Pair this with Au Revoir and Snitch to get tons of power counters while you get paid. Save them all up for one massive, frustrating R&D run for 20 cards! Bonus points if you pair it with Blackmail and Corporate Scandal so you don't even need breakers! It's essentially a flexible hybrid Medium and Nerve Agent, but for less influence out of Anarch. Outside of the aforementioned Snitch strat, it probably won't be worth the slot that Anarchs use for Medium, or the interfaces out of the other factions.